Memo to Flipboard, as well as Pulse, CNN’s Zite and AOL’s Editions: You might want to make some room in the already-crowded news and social reader space, because you’re about to get some bigfoot company. Next Wednesday, according to sources close to the situation, Yahoo will finally officially unveil its offering, called Livestand. And perhaps as early as next week or in the weeks soon after, Google will also weigh in with its version of the genre — code-named Propeller — which also might be the product’s name. Another moniker under strong consideration: Currents. As I have previously reported, Google Propeller is an HTML5 reader for the Apple iPad and Android — essentially a souped-up version of similar apps such as Flipboard, AOL’s Editions, Zite (which was just bought by Time Warner’s CNN) and Pulse. All these apps are part of the drastically changing habits of media consumers, helping users better navigate numerous social and media feeds — such as Facebook and Twitter, as well as news sites and more — using handsome interfaces and touch technologies on tablet devices. Flipboard, the most prominent and elegant of these offerings, is now available only on the Apple iPad. According to sources, Propeller will launch with a plethora of media partners, as well as integration into the Google+ social network. The aim of the search giant is to offer media companies easy tools for publishing content on these devices, as well as a better path to monetization. That is essentially the same plan at Yahoo, which has been working on Livestand with hopes of it being a product that will woo publishers into tight collaboration with the Silicon Valley Internet giant. 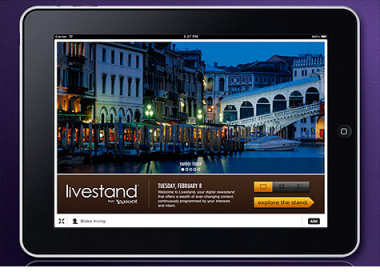 Livestand was announced by Yahoo’s now-fired CEO Carol Bartz in February, at a speech at the World Mobile Congress in Spain. At the time, Bartz demoed a magazinelike platform that would allow publishers to put up content easily and give users the ability to personalize their selections based on search history and interests. But while Bartz promised the product within three months, development has been slowed by its complex technologies, bugs and the need to sign on publishers. Yahoo’s Chief Product Officer Blake Irving is pushing the product hard as a way for the company to reinvigorate its media products. It’s not clear how many publishers Yahoo will have at launch, and neither are the distribution plans, beyond flacking it from the Web site and being present in app stores. Google, on the other hand, has its Android platform to push out Propeller, although it all must work as well on Apple’s iPad, which is the dominant tablet on the market. But just because both Yahoo and Google are big companies is by no means a guarantee of success — think Yahoo 360 or Google Wave or Buzz — and their lateness might be a hindrance. And, in fact, other news reader apps are much further along. The leader, Flipboard, has already had four million downloads and 50 partnerships with leading publishers. It also has started to introduce rich advertising products and, perhaps most importantly, has tight social integration with Twitter and Facebook. There will be social elements on both Yahoo’s Livestand and Google’s Propeller. But news reading will be stressed more, making them more like Pulse, a tiny but highly innovative start-up. Each of the existing apps will presumably compete by adding on more features. Pulse recently added cross-platform, cross-device syncing, while Flipboard is close to unveiling an iPhone version it has said it was working on. Yahoo and Google PR declined comment.